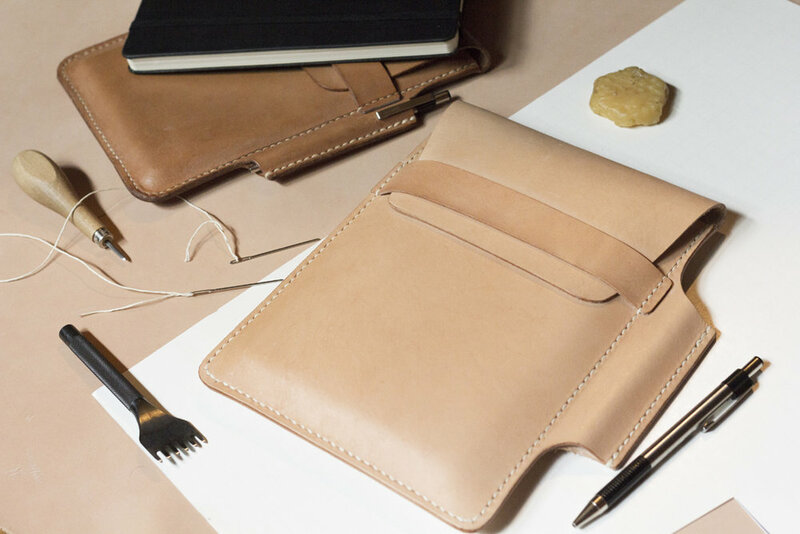 Fieldwork leather bags and cases are cut, sewn, and finished entirely by hand, without machines. We use traditional saddlers’ techniques and modern minimal styling to make timeless leather goods that will last for generations. Each hide is unique and will have its own marks and characteristics. We use natural materials, traditional processes, and have minimal waste. You are buying quality, tradition, craftsmanship, and integrity. We make it like we mean it. Built to love, and built to last. We use cowhide, waxed linen thread, and durable hardware. Natural undyed vegetable tanned leather starts out a pale buff color, and eventually develops a deep honey patina as it lives with you. An occasional treatment with a good quality leather conditioner will ensure a long and lustrous life. If your leather gets wet, please dry it slowly away from heat. Fieldwork has been in business since 2014. We are located in the Minneapolis/St. Paul area.